New Version of the Teenage Mutant Ninja Turtles Trailer! 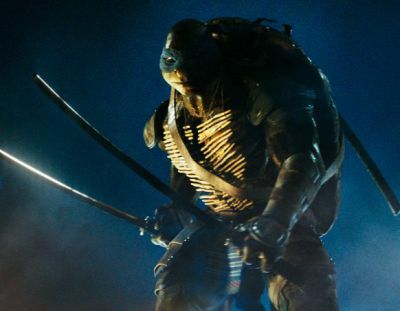 Paramount Pictures has debuted a new version of the previously-released trailer for Teenage Mutant Ninja Turtles that features new footage from the movie, including several new shots of our titular heroes! Check it out in the player below. In the August 8 release, starring Megan Fox, Alan Ritchson, Jeremy Howard, Pete Ploszek, Noel Fisher, Will Arnett, Danny Woodburn and William Fichtner, darkness has settled over New York City as Shredder and his evil Foot Clan have an iron grip on everything from the police to the politicians. The future is grim until four unlikely outcast brothers rise from the sewers and discover their destiny as Teenage Mutant Ninja Turtles. The Turtles must work with fearless reporter April O'Neil (Fox) and her wise-cracking cameraman Vern Fenwick (Arnett) to save the city and unravel Shredder's diabolical plan.